Ola Belle Read, the great songstress of the Appalachian Mountains, reminds us that “you cannot separate your music from your lifestyle; you cannot separate your lifestyle, your religion, your politics, from your music. 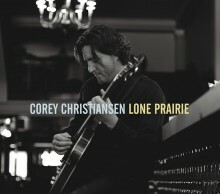 It’s a part of life.” Lone Prairie is Corey Christiansen’s affirmation of that statement: it is the record that reflects his upbringing, his geographical environment, the music that surrounds him, and the values of his family and community. Christiansen is known as a jazz guitarist, but this record expands upon that identity to include all of the elements present in his musical personality. Raised in the mountains and high plains of Utah, he grew up listening to, and learning, the kind of songs presented here–as he puts it, “simple, beautiful tunes with profound lyrics telling stories of struggle and endurance.” That music was with him as he developed as a guitarist, when he learned to play the blues and when Jimi Hendrix and the power of rock guitar caught his ear, and it was with him as he forged a career as a straight-ahead jazz guitarist. It reappears here, filtered through the lenses of these different experiences and joined by three original pieces evoking the landscape and sentiment of the American West. The musicians joining Corey on this record are from diverse backgrounds: they range in age from the mid-20s to the mid-60s, in interest from funky jazz to Afro-Cuban music to computer-generated soundscapes, in provenance from the Pacific Northwest to the Rocky Mountains to the Midwest. But all share his love of beautiful melodies, deep grooves, and intimate musical interplay, and the performance resulting from their interaction is unique. Just as far and wide meet at a single point, and old and new coexist in timelessness, so do jazz and cowboy songs come together here in what is uniquely, undeniably, American. Listen to the sound of the Lone Prairie.